Spring Creek Antiques and Tea Room. A few years ago, I had a booth space at Spring Creek, (and a few other spots) but they became too hard to keep up with. Hubbs was great to help me out with the big things, but even with his help, there was lot's of lifting and carrying of merchandise, and getting exhausted. Those of you who have or have had a space at a flea market or antique mall KNOW that it's pretty much something daily and that there are days that you literally work your patootie off. But it's still "in my blood" as they say. I miss it all, but now I just have to be happy "styling" my house and enjoy shopping...I really DO still enjoy the shopping part! So, back to shopping, I found this wonderful "Sampler" at one of the shops. With some pastel pinks and blues, it looked Spring-y to me. I have it in my little hallway that's off of my office/creative space. (I use that "creative space" loosely, ha ha) I still have some things left to get unpacked in there, but I'll share it with you eventually. 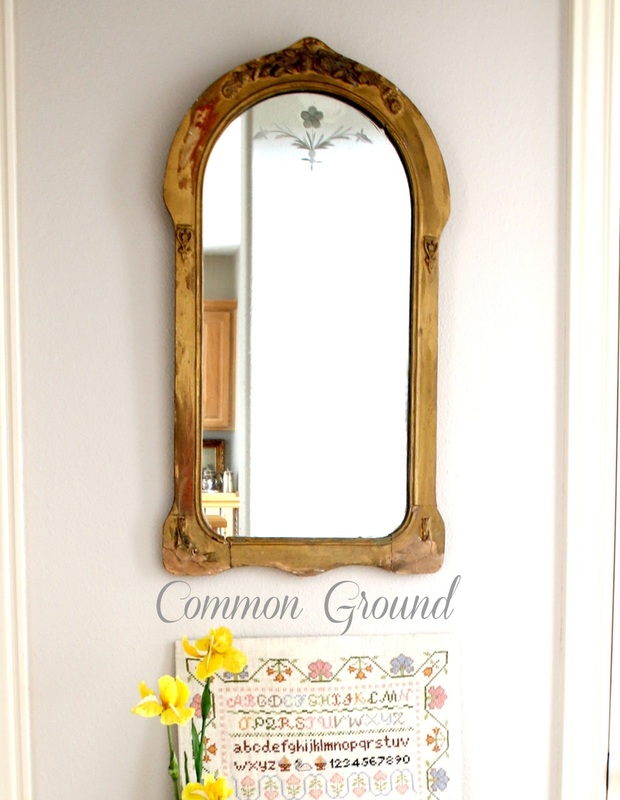 The mirror is an antique that I had up at the old house. It's super heavy and required hubby in his official "wall decor hanging" capacity. I'll need to find a frame for the sampler. We have boxes, (yes, boxes) of empty antique frames that Hubbs has collected. He used to frame antique documents and photos for his own booth space so that's why the obsession, addiction, collection. Anyway, I hope to get my hands on one soon. 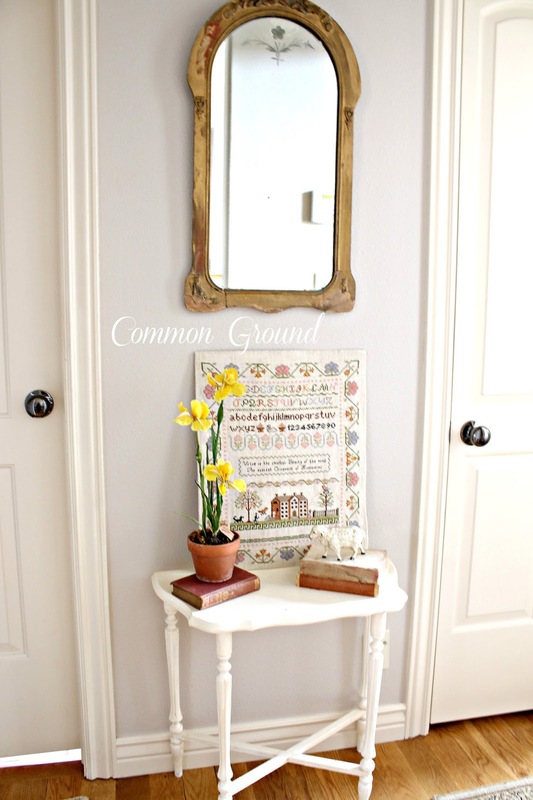 I'd had this little table in the Dining Room (at the old house), next to my white church pew. The church pew is downstairs here, along with some other white pieces, awaiting my time and energy in a little kitchen nook. I have great plans for that adorable little "kitchen nook" but right now the need for a new tread mill and my exercise bike have had a priority over the kitchen nook decor. After going through the cardiac rehab, I knew I needed to keep up my momentum. All I have to do is walk downstairs and I'm instantly shamed into action by their presence. Since decorating is moving at a snail's pace I feel a little victory in getting this hall spot done. You see it from the Living Room, so it needed attention. I always try to buy any stray needlework at fleas or antique malls if they are affordable. I know all the hours, talent, and patience that go into them, so I want to enjoy them as much as the original creator and recipient. Those are some GIANT birdies flapping around down there! I'm glad that you rescued thar sampler. Someone spent a lot of time on it. It looksperfect there. What a special treasure to find Debra. Someone did a wonderful needlepoint and it looks great where you put it. I love your sampler Debra. They are such a treasure. That's a really nice sampler and in great condition. It's so nice that you're giving it another life in your home! The sampler is adorable. The sheep is cutie too. 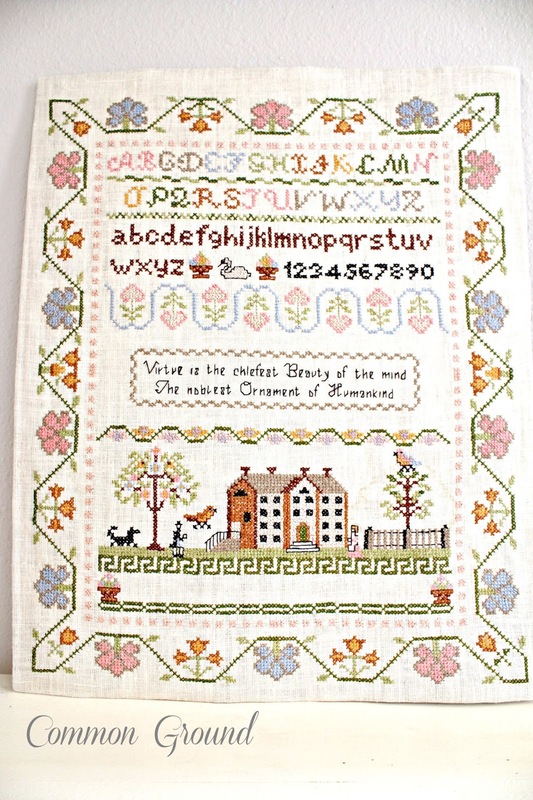 What a beautiful sampler! I know it took many hours to complete (I've made them myself). I'm so glad you were able to save and share it with us today. I like the mirror, too. I know it takes a long time to get everything the way you want it after moving in. Looks like you're making good progress though! 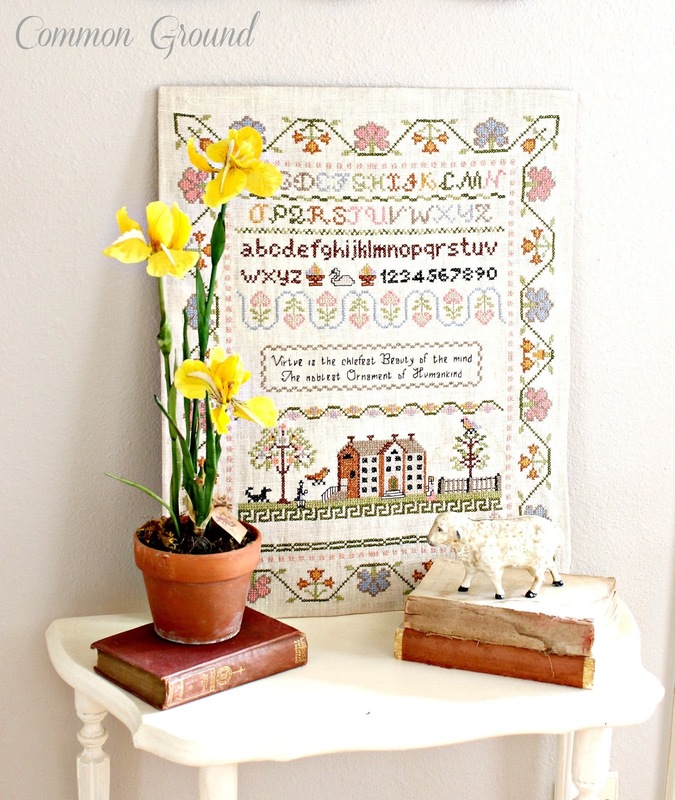 The sampler you found is lovely. I agree those birds are large. Lol!! We pass thru that area of Missouri often and I plan to stop in for that chicken sandwich. Thanks for the tip. they have a FB page, I think, you'll love the food. Be prepared for a little wait, it's well worth it. just shop during your wait! It is nice and sunny here, and that makes it a great day! Lovely sampler, Debra. It needed to be rescued and yours is the perfect home for it. 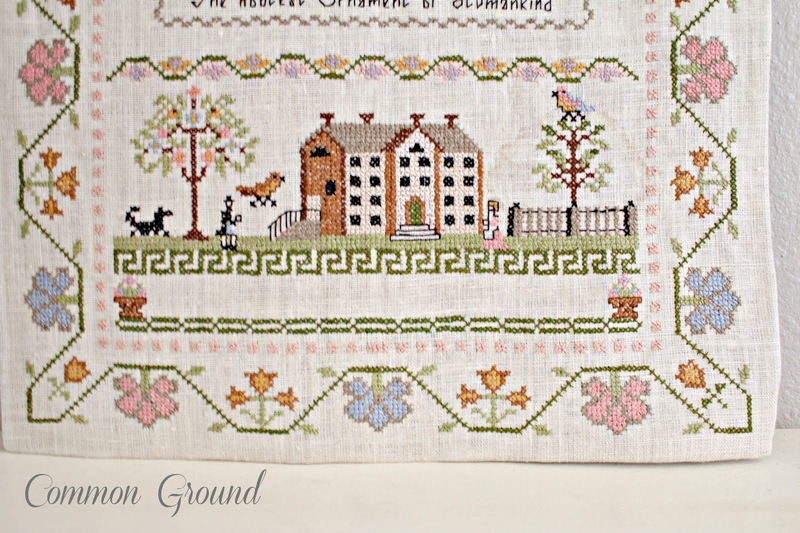 What a beautiful sampler, Debra! I used to do a lot of cross stitch. 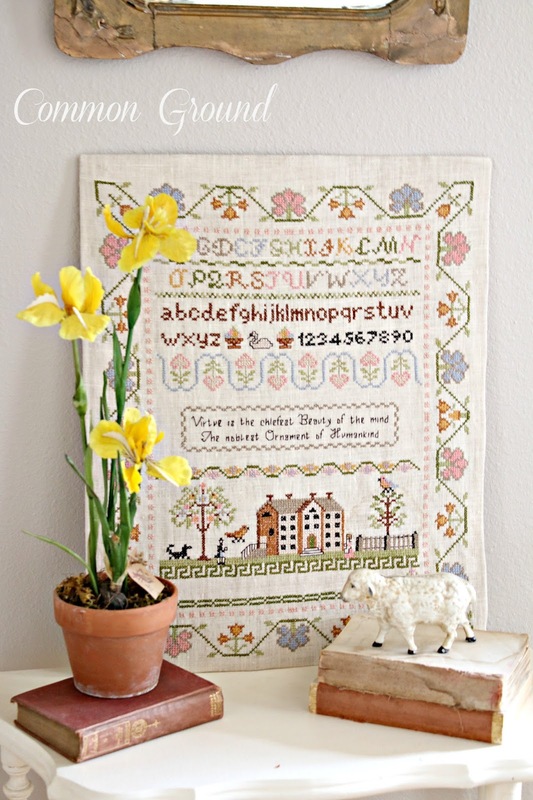 This sampler you've shown reminds me of one I have and never finished - a floral alphabet. I got up to "S" and stopped. I think I actually burnt out from all the cross stitch I did non-stop. I still have it and should really finish it. Beautiful sampler. Your vignette looks really soft and Springy! Ohhhh...samplers speak to my heart! There is something so precious and so sweet about those pieces that were created by another human. The time, the precise stitches..the painstakingly precision of counting....love, love, love. I do counted cross stitch, so when I find an old sampler, at a good price, I buy it. Yours is just so cute! I can see why you fell in love with it. Like Claudia said, it was meant to go home with you. For some reason I haven't been lucky enuf to come across any samplers at any of thrift stores we frequent quite often. Maybe I've just missed them or didn't want to pay price for it. I saw in a magazine one time, a whole wall of samplers, like a gallery of them. Looked so pretty. I used to do needlework but eyes and hands don't do too well anymore. Yours is very nicely done. Will you frame it under glass to keep it clean? Beautiful vignette. Love the sampler! The sampler is gorgeous! I spent many hours making samplers on fine linen back in the day, but they were mostly given as gifts, so I only have a few simple ones that I held onto. 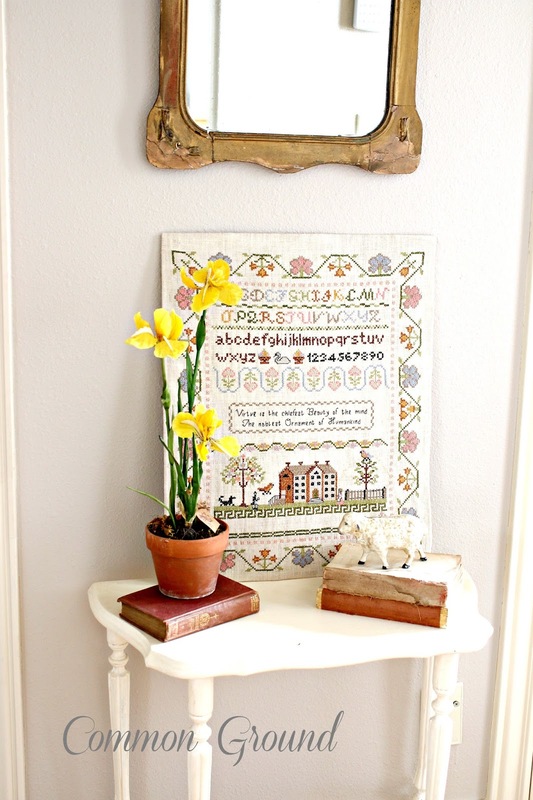 Somebody put a lot of painstaking hours into creating yours and it's the perfect spring accent piece on your hall table. How wonderful that your hubby can frame it for you! I think every little finished corner of a home is cause for celebration! Enjoy yours, Debra! You, dear friend, have such an amazing talent with tiny space decor!!! This petite area is gorgeous!!! The Sampler is truly, a Work of Art and of Heart!!! Debra, The sampler is beautiful. I know exactly what you mean about having a booth. Debra, I love samplers as well. This one is beautiful, and those birdies do make me smile. I picked up a small framed one recently for onlu $.75 cents. I know all the work that goes into them. I have a sampler that I made years ago in browns and rust tones. Haven't even pulled it out since we moved into this home 5 years ago. I think I need to. Thanks for the reminder. Thanks for sharing with SYC.